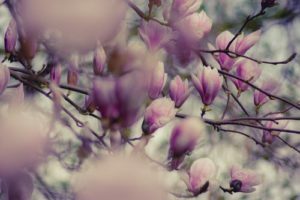 When you think about magnolia trees, your first thought is of a majestic plant, growing in well-kept lawns or in large gardens, bearing large pink or white flowers in early spring. You see them in gardens but never in pots due to their large root system. Your second thought is that you want one but that I have no garden to put it in. This article is about the suitability of growing magnolia in containers. If you are going to use a container, you will get a level of control that is not available to those who grow directly in the ground, so that it may grow better than normal. Generally, magnolias love sun, then containers offer a distinct advantage that it can be moved to any location in the garden to maximize sunlight exposure. It will also allow the magnolia tree to be moved into the greenhouse or conservatory in winter to offer maximum protection from severe frosts. This is especially advised when the specimen used is young. What must be noted is that not all magnolia varieties can be planted in a container. This is especially true of the giant varieties. Dwarf varieties that grow less than 3 m in height, will do well in containers. Star, Ann and Southern Magnolias all can be grown in containers, even Saucer Magnolias at a push if you have a big enough container. Remember magnolias are trees and will have a complex root system that needs feeding and watering, more than other plants in containers. Magnolia roots grow very quickly and intricately, so getting the right size and shape of the container is of ultimate importance. A general rule is that for every centimetre of girth the tree makes in diameter, a 30 cm increase in height and the diameter of the container is required. For example, if a mature tree has a trunk diameter of 5 cm, then the container needs to be 1.5 m in height and 1.5 m in diameter. As you can imagine this is quite a large container, requiring a lot of compost, feed, and watering. Fill the bottom of the container with any salvaged material that you have available. This could be broken crocks, stones, or anything else you may have lying around. You will then need to fill the container to near the top (about 2 cm below the container rim) with multipurpose compost, mixed with small amount of sand to make it free-flowing and not heavy. Moisture needs to be retained as to make the compost neither too wet nor too dry. As typical when planting any tree, you will need to dig a hole twice the size of the root ball. This is carried out to allow the roots to grow freely and without hindrance. 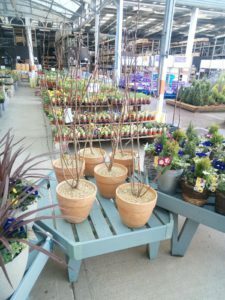 Place the magnolia tree in the hole, making sure the tree is planted at the same level of depth as it was found originally in the store bought container. You then backfill with multipurpose compost, making sure that the compost is firmed in. As an alternative to multipurpose, ericaceous compost can be used but as this is more expensive than other types of compost, and therefore it is not recommended to use unless you can afford it. Once the tree is planted, mulch needs to be added on top of the compost layer. This can be anything from woodchips, cocoa shells, slate or decorative chippings ( see https://mycontainergardener.com/general-plant-care-in-containers-mulching-and-other-things on how to do this). The choice is up to you. In order to support the tree, a stake is required to ensure that the roots are not damaged in windy conditions. The stake needs to be planted adjacent to the tree (making sure that no roots are damaged when the stake is placed in the container) and then tied with two tree ties. One placed near the top and another near the bottom. The fully planted magnolia tree will benefit by being placed in a sunny, sheltered spot. It may be better to move the tree around within its container until a position is found where the tree will thrive. Ann magnolias are more frost resistant and can be placed in a permanent spot outside if some frost protection is provided. Water whenever the soil is dry, but especially in the first year of planting. This will ensure the survival of the tree, as it takes that long for the tree to establish. Most trees fail in the first year due to insufficient watering, so do not water too much or too little. Ericaceous fertilizers are recommended at the manufacturer’s recommended dosage, at least one time a year in early spring. In this article, the selection of suitable varieties, its method of planting and maintenance of magnolias to produce a healthy tree, has been discussed. Magnolias can be grown in containers with the right selection of tree, container, positioning, watering, feeding, and mulching. Be sure to enjoy your beautiful blossoms in spring, glistening in the sunlight. If you have any questions or comments, then please leave a comment below and I will get back to you. I am glad that I came across your blog! It is Spring and that means my husband spends all of his free-time working in our home garden. I am not much of a gardener myself, but my husband is…so, I will be sure to share this post with him. I think this concept of planting in containers, especially Magnolias, will be of much interest to him. Gardening, as they say, is good for the soul. You and Your Husband will appreciate the tips that I am giving. Spring is the busiest time for gardening in seed planting and preparation. Good luck in the growing season. Oh my gosh! I can grow a magnolia in a pot!? Awesome! Thanks for the great instructions. It is amazing what pant breeders are doing. They often make plants that you first thought impossible to grow in containers possible. This will be discussed in future articles. I really appreciate this post because it came at the right time. I am currently preparing my garden for planting season. I am going to bookmark your post. Thank you so much! Thank you for the warm words. I have a lot of ideas for forthcoming articles. Please visit back. As magnolias like plenty of sunshine then it is better to plant outside in a container, but they can be brought in winter, especially when severe frosts are forecasted. What an interesting concept! I’m a avid gardener but never heard of planting Magnolias in a pot……I don’t have a Magnolia tree in my yard, so, I’m gonna try your suggestion. I’ll try planting a southern magnolia. Thanks for the info. That is the surprising thing about gardening, as you are constantly learning, and Most people do not think about Magnolias in containers. Hope this has got your creative juices flowing. I’m moving to a smaller apartment next month with a small patio, so I’m glad that I found your site. I never thought to put a tree in a pot! It seems like it can be tricky, but your post lays it out so that anyone can try it. I have a few questions though. Why put “salvaged material” on the bottom of the pot? And what makes “ericaceous compost” more expensive? Thanks for the kind words. To answer your questions salvaged material will help with drainage to prevent the drainage holes from getting blocked by compost. Use salvage material as it is more environmentally friendly. Ericaceous compost is more costly as it is not used as much as multipurpose compost. Thanks, Antonio, this was a great article. I am Canadian, so, unfortunately, we can’t grow them up here, but my son and daughter in law now live in Texas. I was able to see these beautiful trees up close when we visit. I’ve told them that when they buy their first house, I want to come down and landscape for them. And the idea of having a magnolia in a pot is awesome! I’m bookmarking your page for future use! I hope your son and daughter in law find a home soon, as Magnolia in pots look brillant. Thank you for the bookmark.